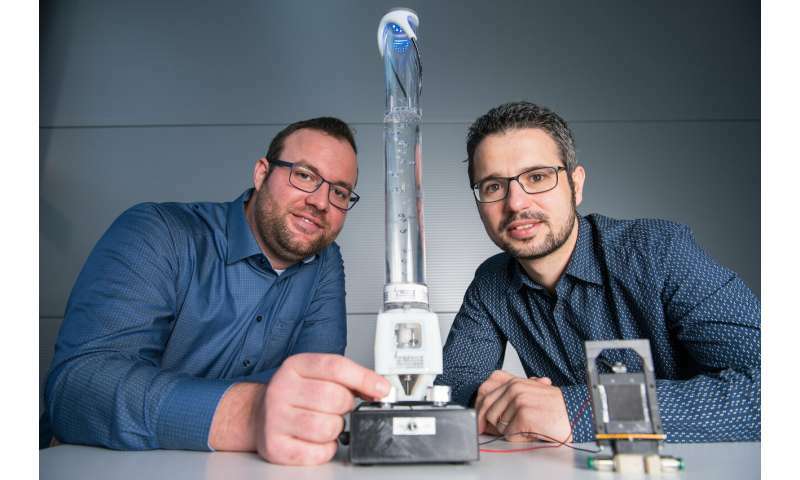 The valves and pumps being developed by the research group led by Professor Stefan Seelecke at Saarland University are made from electroactive silicone film and offer a lot more than just the typical 'open/close' or 'on/off' functionality. The researchers control the film electrically and can make it execute precise vibrations or pulses on demand, while also monitoring its exact position or shape. This responsiveness makes it possible to continuously vary the flow rate through a valve or continuously regulate the performance of a pump. Another feature of these film-based devices is that they can indicate if they have become blocked by a foreign body. As the researchers can shape the films to fit into almost any casing, the films can be used in a broad range of practical applications. The team will be at this year's Hannover Messe, where they will be demonstrating their technology at the Saarland Research and Innovation Stand (Hall 2, Stand B46). The failure of small valves or pumps in a large industrial plant can cause major problems for the maintenance and repair teams. It can take quite a time before the faulty component has been tracked down. And this can be all the more problematic if the fault took time to make itself felt; the longer it takes to find a fault, the greater the potential damage to the plant. If, for example, a foreign body becomes trapped in a valve and the valve doesn't close properly as a result, it can take time before operators are aware of the malfunction. Thankfully, this situation does not arise with the novel pumps and valves that have been developed by Professor Stefan Seelecke and his research team at Saarland University. 'Our devices are able to communicate their status and their activity in real time. For instance, the valve can tell us not only whether it is open or closed, but exactly how far open it is. If it can't close because of the presence of a foreign body, it can also communicate this fact to us,' explains Professor Seelecke. The valves and pumps created by the Saarbrücken research group are made from a thin silicone film that is printed on both sides with an electrically conducting material. Scientists refer to these materials as dielectric elastomers. 'If we apply a voltage to the film, it generates an electrostatic attractive force that compresses the film, causing it to expand out sideways,' says Steffen Hau, a Ph.D. engineer working in Seelecke's team. By altering the applied electric field in a controlled manner, the engineers can make the film undergo high-frequency vibrations or continuously variable flexing motions. Effectively, the film can adopt almost any required position or orientation. 'These properties mean that the film can be used to design novel drive systems,' explains Hau. Using intelligent algorithms to control the movement of the film, the researchers at Saarland University and at the Center for Mechatronics and Automation Technology (ZeMA) in Saarbrücken are developing self-regulating valves and motorless pumps. 'We don't need any separate moving parts for our pumps. Because the pumps can run without a rotating motor, they are flat, compact and very energy efficient,' says Hau. 'We can control the volume flow rate in these pumps using the amplitude of the applied voltage rather than the frequency, which is what is normally used,' he adds. This enables very quiet pumps to be built. 'As the film itself can act as a position sensor, so too can a component made from it,' says Philipp Linnebach, a doctoral research student who is studying the new film-based drive systems. When the film distorts, an electrical capacitance value can be precisely assigned to any particular position of the film. 'If we measure a change in capacitance, we know exactly by how much the film has distorted, explains Linnebach. This allows specific motion sequences to be calculated precisely and programmed in a control unit. The film-based valve can therefore be used to deliver exactly the required amount of compressed air or liquid. The film itself is essentially a flat structure. 'We have now developed the technology to a point where we can produce films of the required shape. So we can now adapt the films to meet the needs of specific applications,' says Steffen Hau. The technology is cost-effective to manufacture and the components are very lightweight. They also consume very little energy and are more than a hundred times more energy efficient than conventional components. Compared to a conventional solenoid valve, the film-based valve consumes up to 400 times less energy.